This page is about Donald Trump's maternal line and the cultural backdrop to his mother's emigration to New York in 1930. During the 1820s, two sides of the president's family were cleared (forcibly evicted) from their ancestral lands on the Isle of Lewis. This was during what were called the Highland Clearances. His mother grew up in hard times for the island, and a great many of her generation - especially the young men - emigrated if they had survived the First World War. In Poacher's Pilgrimage: an Island Journey, I touched on Donald Trump but did not develop the theme as few people then thought that he would win the presidency. Now, through the Foreword the the American edition of the book (Cascade - and imprint of Wipf & Stock, 2018), the leading American speaker and writer, Brian D. McLaren, has integrated my research on Trump into the story. What follows here are links and visual material that illustrate the points that Brian makes. 1. 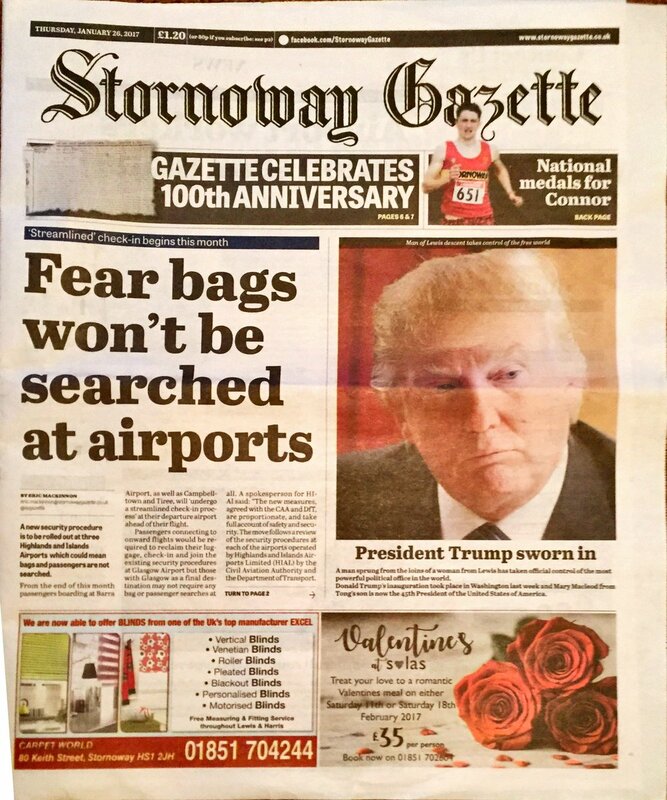 On 26 January 2017 the Stornoway Gazette - the newspaper published on the Isle of Lewis - played down Trump's inauguration six days earlier. Here was no "local man makes good" triumphalism. Note how the banner headline was devoted not to the new president, but to a trivial local issue. Note the unflattering photograph and the miniscule yet portentious headline above it: "Man of Lewis descent takes control of the free world." Note the visceral power of the body text below: "A man sprung from the loins of a woman from Lewis has taken official control of the most powerful political office in the world" (my italics). To me, it signals an acceptance of his island provenance, but at the same time, it cleverly hints at the prodigality of his having "sprung" from being held in the moderating basket of the community. 2. 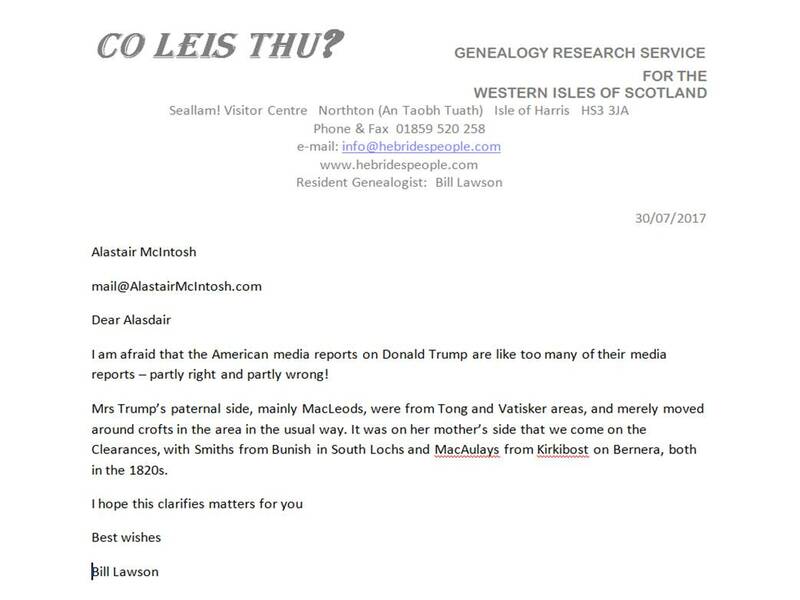 Bill Lawson's letter confirming Trump's genealogy rooted in the Highland Clearances. 3. 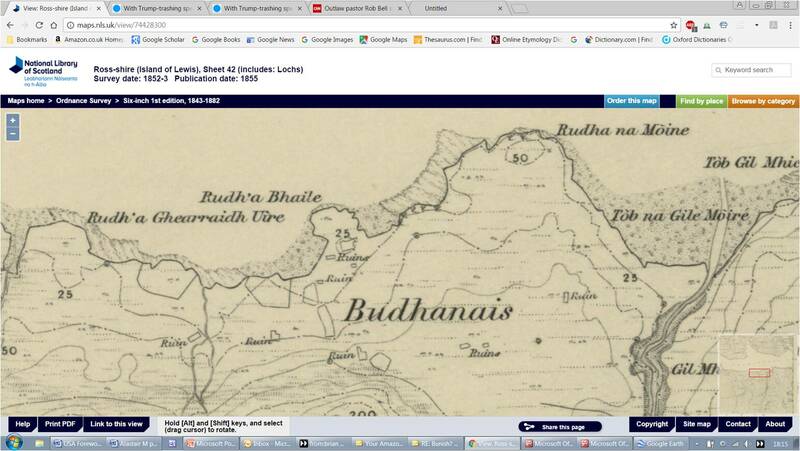 Angus "Ease" Macleod's map in TGSI article, showing cleared (evicted) settlements in SE Lewis - Pairc and South Lochs - including Buhanish (Bunish, Buanish, Budhanais). The variant spellings are because a name like this springs from the oral tradition. Most people in the times when the village was inhabited would have been illiterate, albeit often highly skilled. A school friend of mine who is descended from the same Smith line says that some of them were boat builders - "we were shipwrights" - as he proudly puts it. 5. Close up from the 1855 OS map - note the profusion of ruins that are marked - the abandoned homesteads of Trump's ancestors. 6. Now see those ruins on Google Earth. See, also, how the land is to this day combed with feannagan - raised beds for growing crops - typically about 4 to 8 feet wide. 7. There is a narrative that I've heard from landowner sources that the people who were cleared from the Pairc area of Lewis had only been temporary settlers who moved in when the kelp (seaweed) industry was at its peak during the Napoleonic wars. Be that as it may, this shot shows the cultivation of Budhanais extending over a stretch of coast running for 2/3 of a mile. Constructing these and keeping them fertile with animal manure, shell sand and and baskets of seaweed from the shore, was enormously labour intensive. Imagine building up that whole ecosystem, then one day day being visited by the landlord's factor (legal agent), and told you had to get out. I've heard it said that the men took their belongings round to Tong, north of Stornoway, in open boats under sail and oar. Their families made the weary walk through a terrain thick with lochs (lakes) and bogs - an area that, not for nothing, is known as South and North Lochs. 8. Because we were never told the history of these places, I never took a picture of the ruins of Budhanais when there as a pony boy with the stalking. However, John Randall of South Lochs has sent me this looking west up Loch Shell, showing the lines of feannagan coming down to the sea. 9. The only picture I have of the Budhanais area was taken in 2011 when I was able to return for a week to my old job as a stalker's pony boy (but see 12 below). This shot was taken right at the end of the modern day stalking path that can be clearly seen on Google Earth images and can just be made out as a straightish line about 2/3 of the way up the picture. It is open grazing land that looks down towards Budhanais or Buanish to the right. 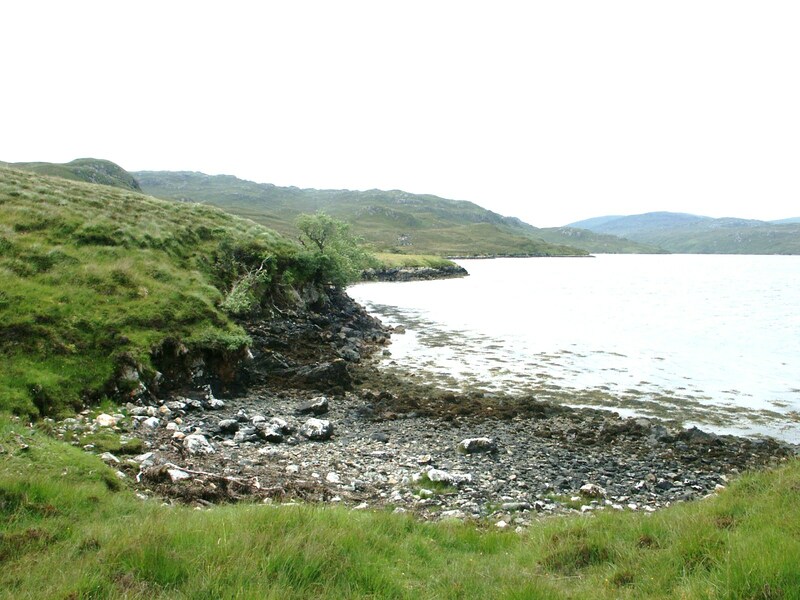 The feannagan (raised beds) and ruins cannot be made out from here, but they're right down by the seashore. The best time to see the feannagan is in morning light from Eishken, and best of all, when a very light sprinkling of snow melted by the wet trenches inbetween causes them to stand out in black and white like the rib cages of stranded whales. 10. 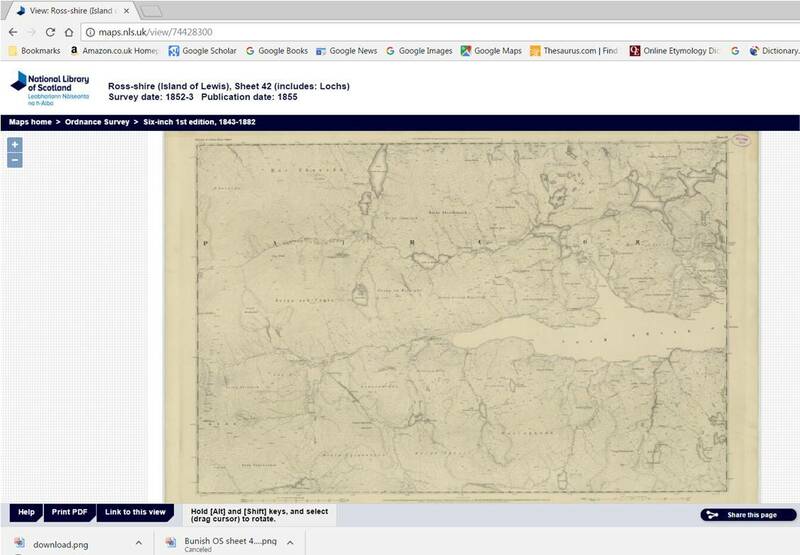 Additional material, added Feb 2019: An account written to the owner of Lewis, Mr Stewart Mackenzie, by a Mr Craig in 1828, on the living conditions of those (such as Trump's Smith ancestors) who were moved to Tong, north of Stornoway. This from Donald Macdonald's "Lewis: a History of the Island", Gordon Wright Publishing, Edinburgh, 1978, p. 163. (I've scanned the relevant chapter here). This also tells how as there were no roads in that part of Lewis, the women carried the children on their backs and drove the stock ahead, while the men took the boats round with the roof timbers, and they slept in upturned boats until they had erected their hovels as described by Craig. Picture of Mary Anne Macleod in 1935, shortly after she had emigrated to America in 1930, from Wikipedia. 11. Note that Mary Anne was therefore of a generation that was immersed in, or close to, seven causes of community trauma that I (and other islanders speaking to me about it) have identified. 7. Mass 1920s emigration of men (in 1923 alone, 1,000 left, mostly young men - fewer left to marry). Leaving aside any personal circumstances, no wonder she and others like her emigrated to America. 12. Only at the end of 2018 did I realise, in reading Lochs News, an often-erudite local newsletter edited by people I was once at school with, that the abandoned settlement of Crothairgearraidh at the head of Loch Leurbost was cleared in probably the same wave of evictions that threw out Donald Trump's ancestors at Budhanais. See also p. 163 of Macdonald's book, where it is spelt Crò Gearraidh. As boys, we used to gather mussels there on rocks there that had been arranged in the crescent of the bay at the half tide mark, to encourage them to grow. We used to play in the ruins, some of which had later been re-inhabitated after the Clearances and then abandoned. 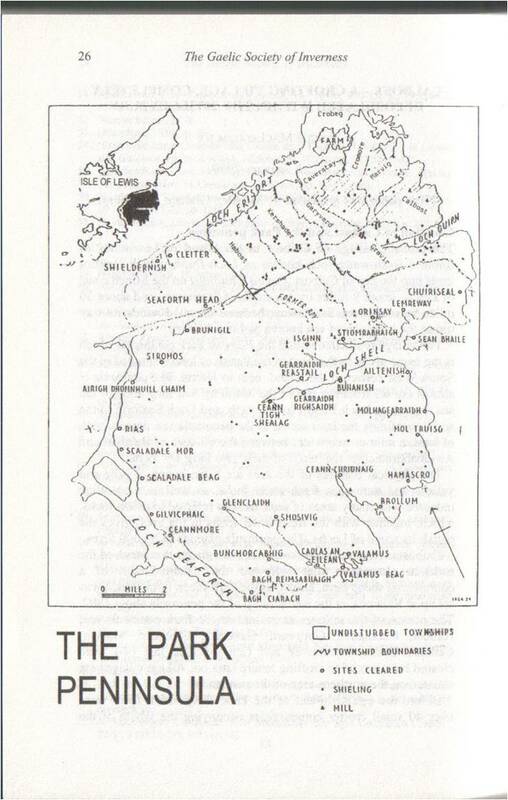 I was puzzled as to how our area was caught up in the Pairc clearances of South Lochs, when we are North Lochs, but Alex George Morrison tells me that in those days the boundary between North and South Lochs was on either side of Loch Leurbost, and several settlements on the south side were cleared. I visited with John "Rusty" Macdonald of the North Lochs Historical Society on 9 Feb 2019. 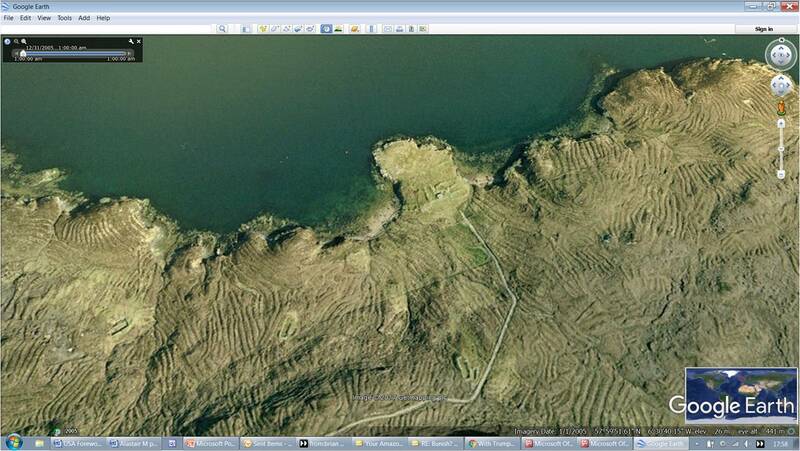 Here you can clearly see the ruins in which we used to play, and the satellite view on Google Earth shows many more. This is what it means never, until now, to have know the history of our place. Only now are these things being widely talked about and actively researched by people within the village. This is the pre-publication unedited text. If quoting, the edited version can be verified from the Cascade edition, pp. xvii - xxii, or from 'Look Inside' on the Cascade web page. 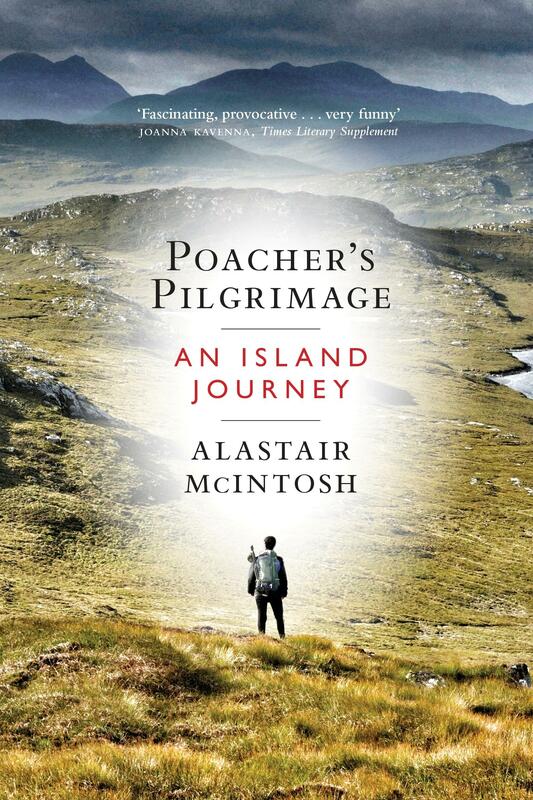 Poacher’s Pilgrimage has been, simply put, the most delightful read of the year for me. The writing is a joy and the experience of reading is the next best thing to donning a backpack and venturing out into fog, hail, mist, rainbows, and sunshine. And like any good journey, there are surprises along the way - gifts for the soul as well as the imagination. But Alastair McIntosh’s account of a twelve day trek across the mountains, moors and treacherous bogs of his home island in the Outer Hebrides of Scotland is far more than just a beautifully-crafted travelogue. Here is an urgent book for North Americans to read, especially in these times. Why, you might ask? Consider this: Mary Anne Macleod, the mother of Donald John Trump, was from a village eight miles north from where Alastair grew up. This President of the United States, it turns out, was a child of the lands you will encounter in these pages. When Alastair made his pilgrimage through the isle that is called Lewis in the north and Harris in the south, he couldn’t have known that one of its native sons (already infamous in Scotland for building a golf course that impinged on a pristine natural area) would soon run for and win the American presidency. In October 2016, while on a European speaking tour to promote The Great Spiritual Migration, I met up with Alastair in Glasgow. We spent a morning at the Kelvingrove Art Gallery and Museum. There we viewed Salvador Dali’s painting, Christ of Saint John of the Cross. I will never forget that morning, just bathing in the gentle light of Dali’s cosmic Christ, so transcendent and yet so human - the very antithesis of the political carnival taking place back in my homeland. Poacher’s Pilgrimage makes only a couple of mentions in passing of Trump, along with a detailed endnote to chapter sixteen. This is not a book about him. Rather, one of its key themes focuses on conservative politicians who prefigured him, especially the two presidents Bush, Donald Rumsfeld, and the role of Billy Graham. However, those insights translate with radical effectiveness onto Donald Trump. Even more to the point, they shed light on the religious psychology of his electoral base. A quarter of the American electorate identify as evangelical or born-again Christians. These voted 81% for this second-generation immigrant son of the Isle of Lewis. Alastair sets out on his island pilgrimage, complete as is a local custom with a fishing rod as if to do a bit of ‘poaching’ on the island’s salmon rivers. A Quaker, but versed in the island’s Presbyterian traditions, he had just returned from Geneva where he had addressed NATO diplomats and senior military. For over twenty years now he has lectured at military academies across Europe – on nonviolence. Our wars in Afghanistan and Iraq were ongoing at the time. Libya, with its flood of refugees into Europe, had not yet happened. Alastair with over forty pounds of gear on his back set out to walk into the lonely heart of his familiar island. His mind was afire with the wretchedness of war and burning with a yearning to understand its psychological and spiritual roots. At the same time, he seemed to be seeking solace from the soil, the grass, the wind, the rain, and the symbolic wisdom of the salmon. On one page, we may encounter in Alastair’s crisp prose the enchanting visible sights of the landscape he traverses: the welcoming inns, the mercurial weather, the holy wells, the ruins of tiny ‘temples’ or churches that can date back to Celtic times, the domed stone ‘beehive’ dwellings know as Druid’s houses that transport us to the Bronze Age, and the island’s haunting stone circles. Turn the page, and the reader finds Alastair recalling a recent visit to a military institution, late at night in the officers’ mess, talking with soldiers about the effects on a human soul of having killed another human. Sometimes the beauty and the violence are intertwined. As Alastair trudges through beautiful glens, stark and empty, and as he skirts the ruins of bygone settlements, he describes how these places were cruelly emptied of their native populations through a series of events called the Highland Clearances during the 19th century. The masters of the British Empire had either dispossessed the old clan chiefs, or turned them into rapacious landlords who favored sheep over people. The land was rendered a commodity, valued only for the profits it could return. The tenants were made outlanders - perhaps dispatched to fight imperial wars, or into intergenerational urban poverty - or onto emigrant ships that were bound for North America. As you grasp this history, a more contemporary real estate mogul will come to mind, and you may feel resonances that are, at once, both fascinating and deeply disturbing. Alastair tells me that after getting in touch with Bill Lawson, the islands’ expert on genealogy, he established some facts of Donald Trump’s lineage. Both sides of the president’s island grandmother’s families had been evicted from their homelands in the clearances of the 1820s. The MacAulays, from Kirkibost on Bernera off the south-east coast of Lewis. The Smiths, from Buanish (Budhanais, Gaelic) in the remote south-west. From there, Trump’s forebear, Malcolm Smith (1760 – c. 1845), nicknamed ‘Calum Taillear’ or Calum the Tailor, was removed in 1826 to the village of Tong that lies twenty miles across sea lochs and rugged territory to the north. It was here that Mary Anne was born. Meanwhile, back at Buanish, the ruins of their homesteads and the abandoned runs of their raised bed agriculture can still be seen to this day. 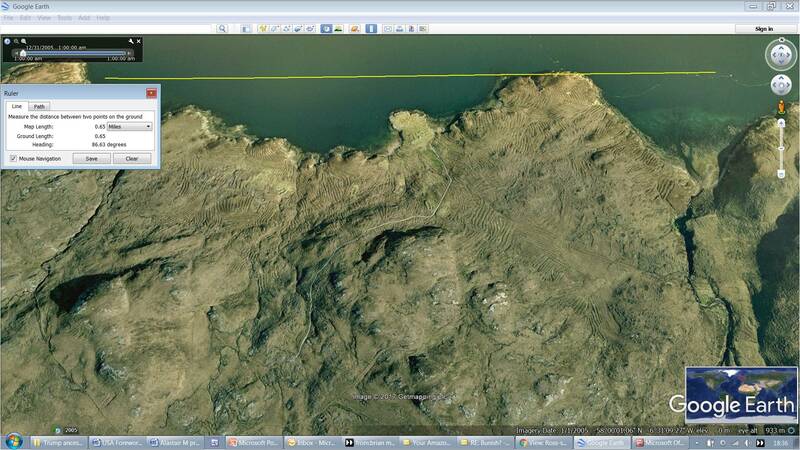 Strikingly so, when viewed on Google Earth, as Alastair shows in a specially created web page, https://goo.gl/zzCMB8. An added factor in Mary Anne Macleod’s background, is that the First World War had hit the island disproportionately hard. Not only did it leave an acute shortage of young men in her marriageable age group, but in the 1920s many of the surviving young men wagered their chances on emigration. It was an era when widowhood or spinsterhood were commonly a woman’s lot. However, Mary Anne had other ambitions. On the day after her eighteenth birthday, she arrived by ship in New York as near-penniless economic immigrant, and took up work as a domestic servant. She was, as they’d say on the island, ‘a bonnie lass’, and for one whose forbears had been evicted by the evils of landlordism, it was an irony of ironies that she should meet and marry an immigrant property developer from Germany, Frederick Christ Trump. The Donald was raised perhaps with certain gifts from his island heritage, including his oratory and famously prolonged handshakes, but without the social checks and balances by which a traditional community raises a child. 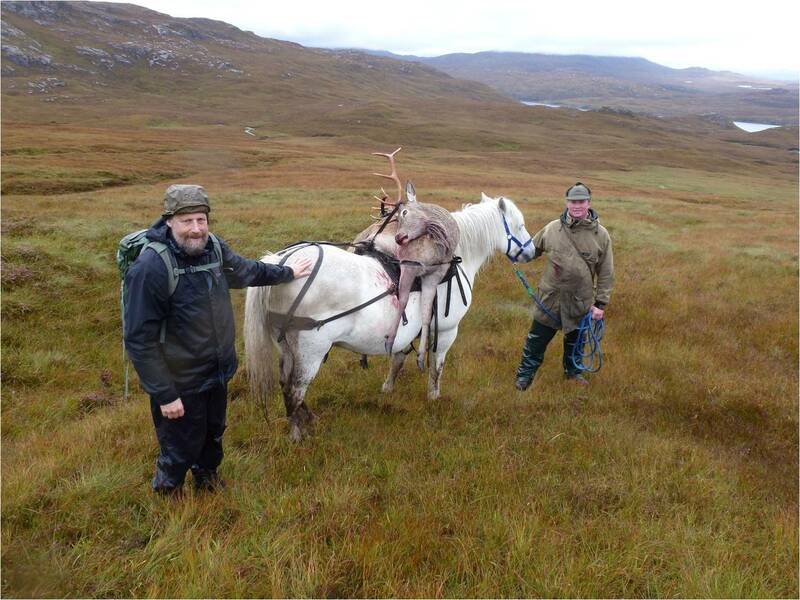 As Alastair explores the psychohistory of landed power and land reform during the course of his walk, he explains how the oppressed so readily become oppressor: you either join them or get beaten by them. But how, then, do you live with yourself? How do you justify a presumption of supremacy over those you now oppress? Here is where this book’s theological literacy aids interpretation. 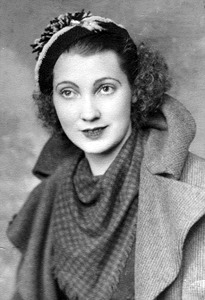 Mary Anne Macleod was baptised and raised in the Calvinism of the Free Church of Scotland. Ironically, that church’s roots in Lewis are in the hard line evangelicalism introduced by the clearance landlords of the 1820s, yet it was founded in reaction to their landed patronage. Trump credits his mother with his religious sensibilities. Back home, within its context of tightly knit communities, such religion can provide a deep and wondrous spiritual path. As Calvin put it, humankind is ‘knit together with a holy knot,’ and this can foster strong communities. But history also provides many examples of the ways in which Calvin’s theology of double predestination can project out a harshly binary worldview, a cosmic soul-sort or apartheid, that divides the mass of humankind into the Elect on the one hand, and the Damned on the other. To Alastair (and to me as well), many of our most important political problems have theological roots, and each step of his journey seems to lead him deeper into theological reflection. Notably, he challenges Calvin’s penal substitution notion of the meaning of Christ’s crucifixion. We have been fed, he says, a violent theology of violent men of violent times. Our burning task today must be to disarm such theologies, and decolonize the soul. That brings us back, as little children, to the gospels and the first apostles. Back to these, seen in a fresh, nonviolent light. If this sounds heavy duty for a lovely walk, fear not. Alastair’s theology flows seamlessly through his acclaimed nature writing, his love of his own people and their history, and his frequent unexpected bursts of humor. That includes exploring ‘faerie’ legends of the landscape as a ‘metaphor for the imagination’ – a depth of imagination that, he shows from early Celtic texts, leads us into nothing less than God’s imagination of the creation. This deep imagination, you will feel, just might have the necessary magic to heal the psychic wounds of war, not to mention the ordinary background trauma that we take for granted but which numbs our sensibilities from day to day. So this book leads readers both on a physical journey through a very earthy landscape, and on a spiritual journey into deep recesses of the soul and spirit. Just as pilgrims often undertake a pilgrimage in a quest for healing, Alastair’s pilgrimage invites us to face our own individual and societal scars and trauma, rekindling our inner life, reintegrating our inner and the outer imaginations, re-sensitizing our individual and social souls that have been so battered, savaged, and calloused by violence. In one pivotal scene, Alastair leads us to a kind of inner pinnacle, from which we see Christ’s crucifixion not as the outpouring of a violent God’s wrath on an innocent victim, but as Christ’s utter absorption of the violence of the world. As I read, I felt that I had been led to holy ground. I am a better human being for having joined Alastair on this pilgrimage. And on a more mundane political level, I am better prepared to understand such figures as Mary Anne Macleod’s unavoidable son, a prodigal son, if you will, who has yet to come to himself and find his way home. Come home in your mind! Come home to gentle honest folks! Come home to nature’s guileless way!